Gligamesh and Enkidu and other beefy fellows. Printmaking is progressing onwards, seventh week already; received my first grade for the etching/aquatint segment of course. I’m pleased with the grade. I’m less pleased with my actual mastery of this tricky medium, trying to be patient and enjoy the discoveries. It would be lovely if I were a relaxed, easy going southern Californian like my fellow students, everything that is produced is “G-r-e-a-t!!!!”. Anyway, the following print was designed to showcase my understanding of the various techniques taught within the last few weeks. I upped the ante a bit by choosing a larger plate (9 by 12) and focusing on drypoint which everyone in class including the teacher seems to shun; I love the technique. 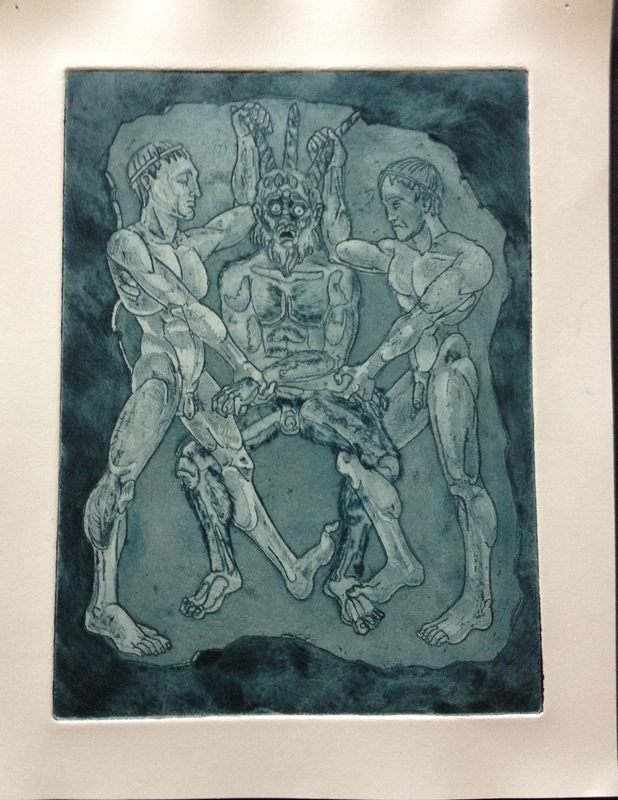 The techniques are a soft ground transfer, with drypoint and aquatint ; the aquatint failed multiple times to produce sufficiently dark value- the plate became warped and the rosin would not settle properly. 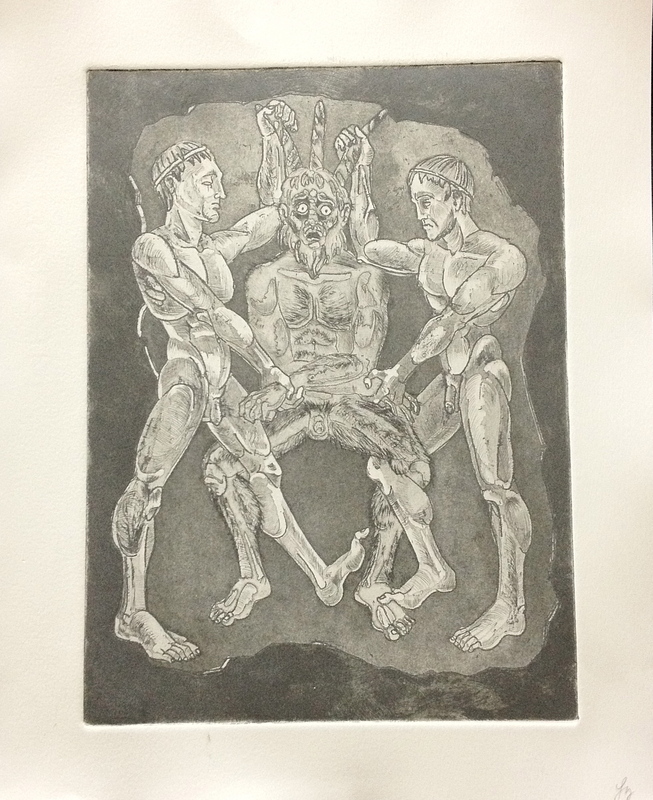 I compensated with drypoint. The above image was printed in a particularly pretty blue, I also ran a run in graphite, pretty color, but a bit weak. Actually, I rather like the color. 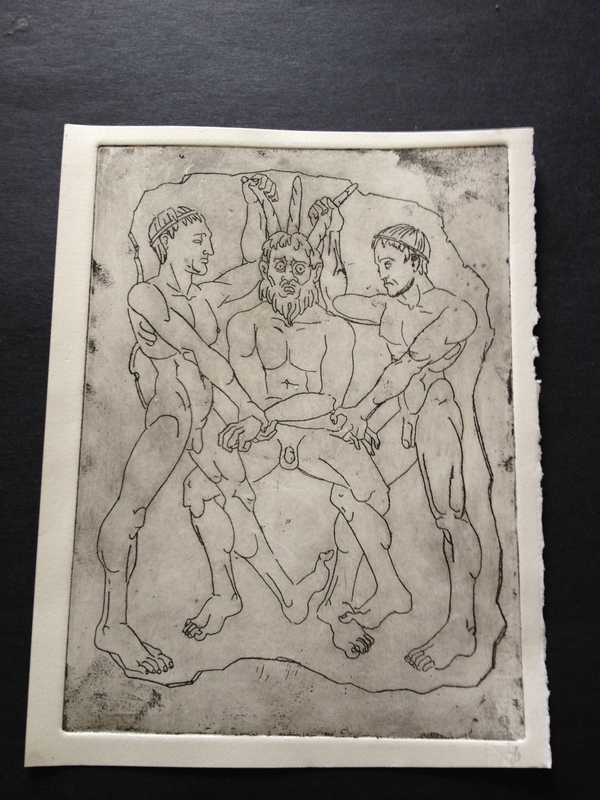 My first proof was just the soft ground etching, which I liked, reminded me of a very primitive Flaxman print. We initially begin the project with a value drawing. 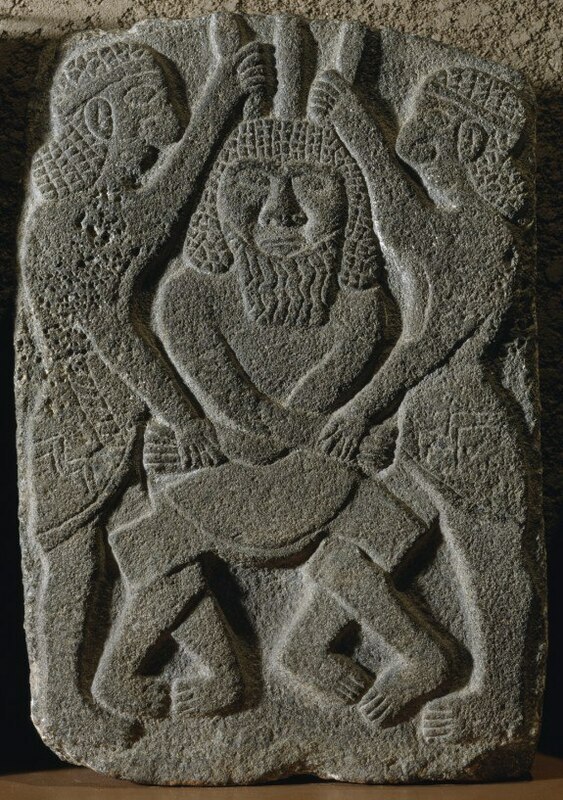 My inspiration for the print was from a spectacular Syrian bas relief of the 10th or 9th century; I’m crazy for its archaic quality and its humor. basalt relief, from palace of King Kapara at Toll Halaf, Syria. When I began this class I also began a large painting, 50 by 60 inches. Taking Clive’s advice I decided to move the action forward (the Syrian relief an inspiration). I made use of my Hero Twin maquettes and have been busy painting since. I am nearing completion. Until I post the final image I thought I would tease with my preparatory sketch. 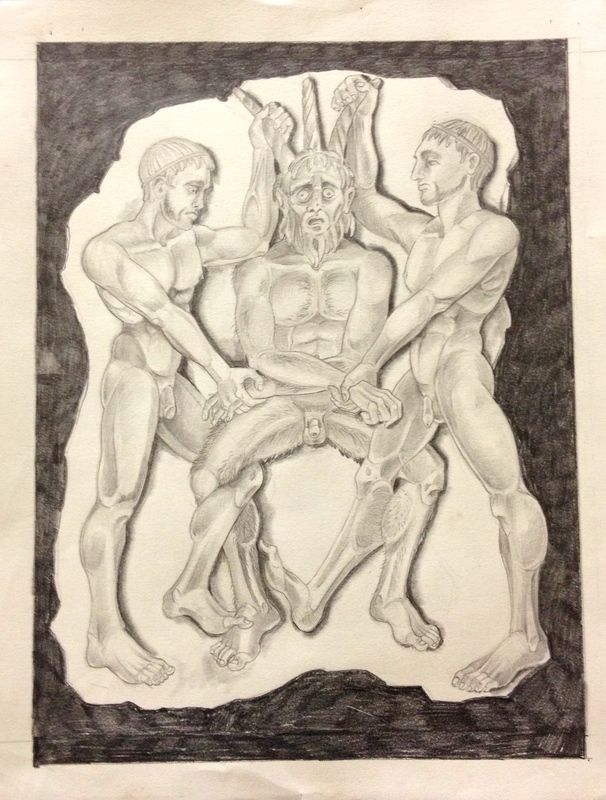 Preparatory sketch for the “Resurrection of the Father” with maquettes of the Hero Twins. Well I must get on with my day, an evening class but first a studio day to work out a plan for for mono prints, our next adventure! wow! you have nailed these techniques! it’s inspiring! i love your drawing, and the prints are all fantastic, but i must confess to my natural inclination towards the blue. 🙂 i really like their toes, not to be odd, and the hairy legs of the beast and his rather dismayed expression. fantastic. 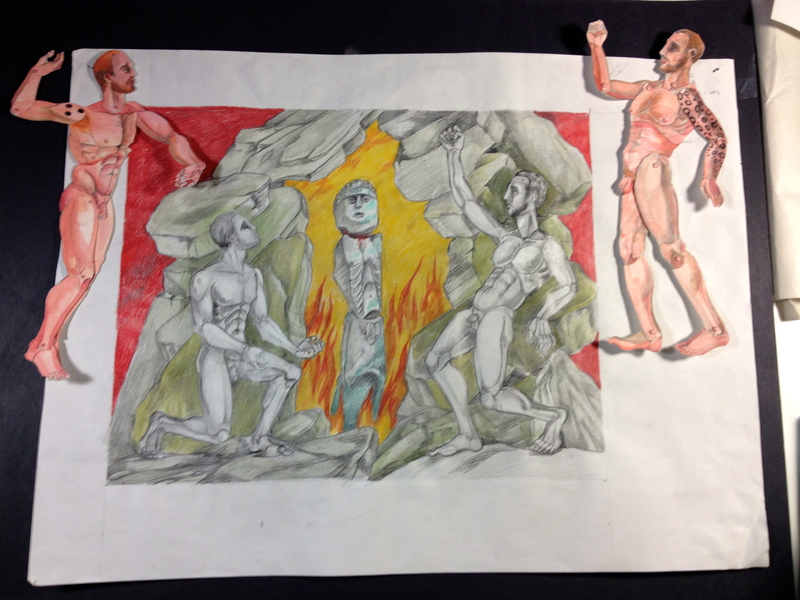 i am really excited about this new painting–i have found myself partial to your rendition of flames, and i am intrigued by the stone-cut look of the middle figure. fantastic maquettes 🙂 . Thanks, I don’t think so, but I’m trying to tackle the medium.The drawing is far easier. Happy you like the toes! The stoney central figure is a fertility totem from a Pacific Northwest tribe, I saw it at the Portland Art Museum; it is a fantastic object. Take care my friend, have a great weekend! The new print and the new start on your painting are both fantastic! Like Zoe, I think the blue works nicer for the print, it has more depth and richness than the grey. I can see how that grey would work really well with something pattern-oriented and crisp, but for something more mysterious that you might find deep in a cave… the blue! Don’t stress yourself too much about mastery, if you can help it. I think etching is the sort of art form where things often don’t turn out how they would be expected to. Sometimes that unpredictable element of it can be a very good thing too! (Though, of course, more often it is frustrating as all hell.) Maybe a good outlook is to learn how to alter oddities, how to correct problems, how to incorporate some of the unexpected effects, that sort of thing. 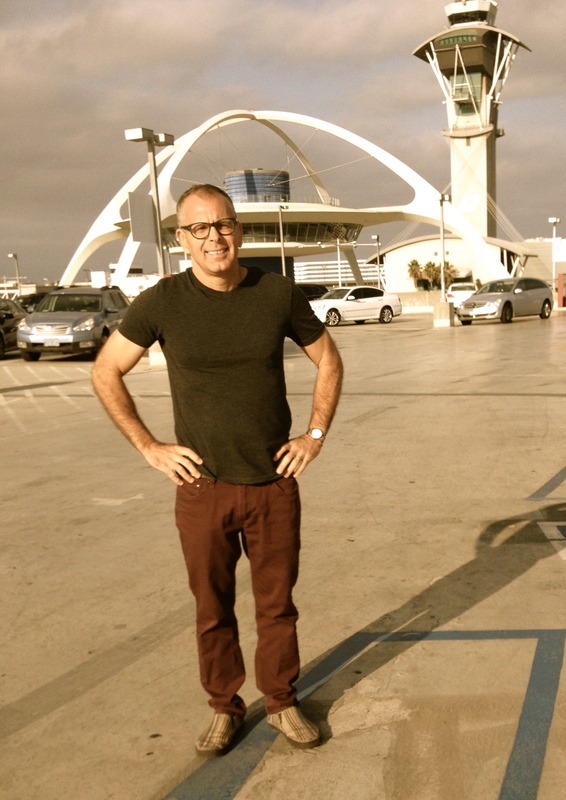 Sometimes it is just very one step forward, two back…. I think this is true for everyone making prints. Anyway, it looks like you are doing really well to me! Thanks, i really appreciate your guidance and interest during this period of learning . It does seem to be a process, though technically direct, printmaking has lots of wiggle room for error-or happy accidents. Inconsistencies I find difficult to appreciate, but I’m trying. I’m taking many steps backwards in that my first print is probably my favorite . I’m enjoying the process even with the frustrations. Ink on paper, nothing quite as lovely. Tuesday we begin mono prints , I cobbled together one on Thursday,I confess it was a bit blah.